"Love" token, awarded by zhaofengli. We have noticed that Citoid now starts experiencing problems with certain news websites when users try to generate a reference using URL. Some characters are not displayed properly. An example would be http://nna-leb.gov.lb/ar/show-report/371/, from which Citoid extracts metadata containing UTF-8 replacement characters. Mvolz triaged this task as High priority. 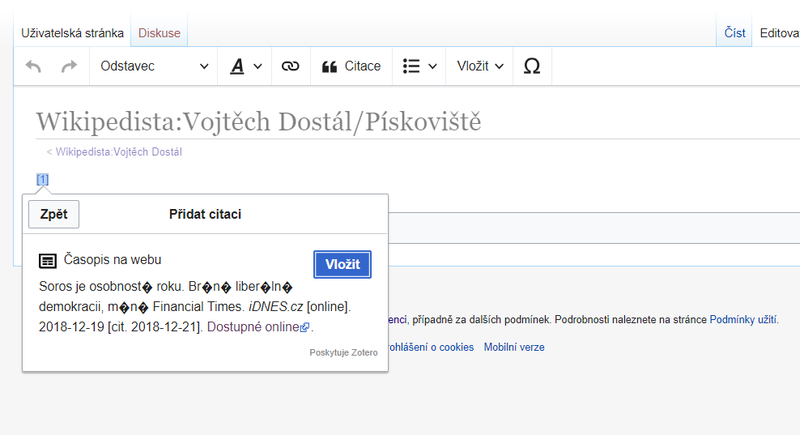 Mvolz renamed this task from Problem with encoding in Citoid - generation of reference from certain websites to Problem with encoding in Zotero results coming from Citoid. Mvolz added subscribers: jeblad, Danmichaelo. I wonder if this should have higher priority, as it is pretty damaging for the editors. It is already pretty difficult to convince them to add sources, and fixing encoding errors isn't fun at all. Mvolz added a subscriber: marcella. Well Martynas at zotero figured it out :). This is the highest priority it can be reasonably be given I think. Unbreak Now! are mid deployment cycle type fixes. We could consider a hotfix that returns two citations, one from zotero and one from citoid and the user could pick the one that does the better job, but that would mean all requests will show at least two citations and some might appear identical - @marcella thoughts? Mvolz removed a project: Patch-For-Review. Zotero did a quick fix for us and I've now deployed it, hopefully things should be all set now.